The plants reached a height of ~1m, which according to the internets is considered pretty standard. Over the next few weeks the stems changed to greeny-brown, lost their lower leaves and began to develop seed pods. Once these pods had hardened, the crop was harvested and allowed to dry. Flax stems drying after harvest. Rippling: In order to ensure the long term sustainability of the project, the seeds were collected by crushing the pods with a high tech lump of wood. The seeds came mixed with a massive quantity of “chaff” from the crushed pods, and so the whole lot was dumped in a bucket of water. The chaff floated, while the seeds sank, and so the seeds were collected and dried for use later. I’m not sure what effect the soaking will have on the seeds, but if it turns out I’ve wrecked them I’ll just fork out another $3 on ebay for some more seeds. Retting: Retting is the process by which the outer, fleshy layers of the plant are rotted away, allowing the fibers to be more easily removed from the stem. This was by far the most daunting part of the whole project, as I wasn’t sure what to expect in terms of smell.The dried flax plants were placed upright in a (CLEAN) wheelie bin, and the plants submerged in water. The soil was deliberately left on the roots as a means of introducing the soil-born bacteria responsible for the retting process. The bin was left in a sunny spot to allow for a nice warm fermentation environment. I have heard and read bad things about the smell produced by retting. It is understandable that on an industrial scale it would be really bad, but the amount done here was nothing to write home about. It was perfectly fine to open the bin to inspect progress without even holding ones breath. Only taking a big, deep whiff would cause concern. Breaking: The stems were given a couple of days to dry in the sun, after which they held no real smell, and were brittle and crunchy like straw. The next step, Breaking, entails smashing up the woody core of the plants to release the fibers. The ‘flax-break’ I built was more-or-less based on some 18thC German ones I found pictures of. I did conduct a quick search for similar machines in 14thC manuscripts but didn’t find any. (didn’t look particularly hard though)… Archeological finds in Norway have uncovered bits of viking age flax breaks that are virtually the same, so it doesn’t look like the design has changed much in the last few hundred years. Starting near the back of the jaws, the stems are crushed, and gradually worked forward to where the jaws are closer and less forgiving. the brittle stems shatter easily and the woody material falls away to reveal the fine fibers. Scutching: Once the stems have been thoroughly abused by the flax-break, leaving only small pieces of broken straw and stem, the flax is scutched. This involves beating the fibers against a board to further break up and remove the remaining chunks of stem. Hackling: The final step in the dressing of the flax is hackling. The bundles of fiber are drawn though a ‘hackle’, or ‘hackling comb’ to remove the final pieces of straw and disentangle the fibers. I made two hackles, the one on the right has 9 nails per square inch, and the one on the right has 25/sqr in. I may need to make another finer one later to really thoroughly clean the flax, but its a start. Hackling is quite straight forward, and results in a neat bundle of long fine fibers, or “stricks.” The short tangled mess left in the hackle is called “Tow,” and may also be spun to give coarser, lower quality thread. The ultimate aim of this experiment has been to create a “flax to linen” display for out craft table at shows. For each processing step a sample was taken and will be kept for this purpose. Dressing Flax, start to finish. 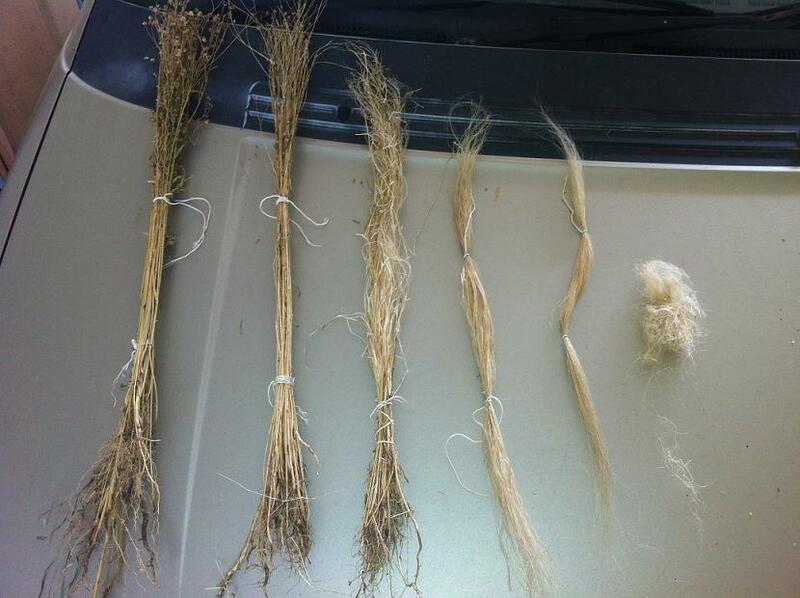 From left to right, the bundles are: (1) Harvested Flax, (2) Retted, (3) Broken, (4) Scutched, (5) Hackled (Stricks), (6) Hackled (Tow). I still have a decent bundle of fiber I’m still working on, but once its done it will raise a new question: Who wants to help me spin it?? ?